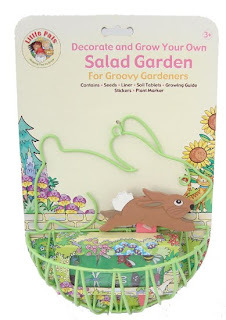 Just a quick post to let you know that we now have a dedicated children's gardening department at Cottontails. It has been a new and different experience to write the product descriptions - I am so used to describing soft cuddly things that are safe from birth, it is an altogether different thing to be describing, for example, a 3' garden rake - not safe from birth! 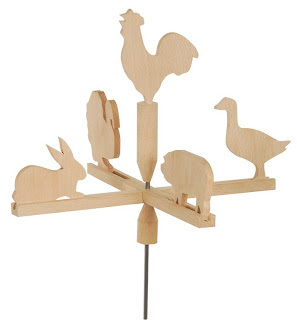 One of my favourite things is this small wooden weather vane - perfect for the shed, summerhouse, play house etc - when I get some spare time and a sunny day I am going to put one up on the Cottontails office. Just a little update on Ernest who left for his next destination at Pomona's last week (in case people are wondering where he is, and thinking that maybe I have rooster-napped him and not actually sent him on his way at all - which did of course cross my mind....) Anyway, Pomona has left me a message to say that Ernest has indeed arrrived in Faversham, but that the family has been a bit under the weather so there hasn't been chance for adventures and postings yet... but keep an eye on Pomona's blog and I'm sure he'll pop up very soon now. HI Charlotte! The gardening center for kiddies sounds wonderful! We are all lots better now, and Ernest has had a chance to go out and play - lots of pics on my blog today!